It's finally gotten warm enough in New York to open the door and venture out onto our balcony. We were immediately greeted by the neighborhood squirrel. 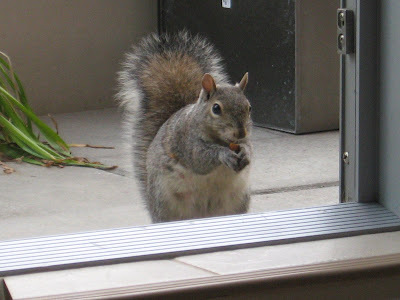 Tom has been feeding him/her/it honey roasted peanuts and sunflower seeds. As midwesterners transplanted to NYC, we are obviously starved for encounters with nature, but this squirrel is scary tame. Assertive city squirrels are known to march into apartments and open the cupboards. I'm just waiting for him to whip out a little knife and demand my nuts. haha, oh my goodness. he's a cutie but if he does whip out a knife, my suggestion to is to run! LOL... Tell your guests that you've turned your balcony into a NYC wildlife exhibit... you might start a trend!